It is spring, 1946. People are longing for a regulated and normal life. Food and heating materials are very hard to come by, the black market is booming. Many families are afflicted by hardship and hunger. Food supply is regulated by ration cards, living space is in short supply, as ever more refugees and displaced persons flood into Landsberg, the city on the banks of the River Lech. Many apartments have been sequestered by the military government, the owners have been forced to move out, and are living in cramped conditions with many people crammed into a single room. 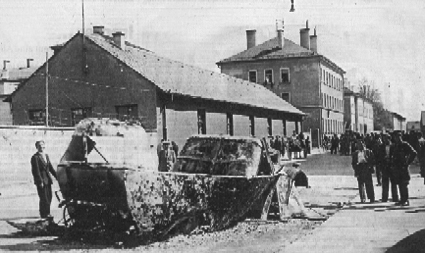 Many of the survivors of the concentration camps of Landsberg and Kaufering are homeless. They have been separated from their relatives, deported from their homes, their families ripped apart. Many have no idea whether their spouses, children or parents are even still alive. Others are certain that their relatives have been gassed, murdered, burnt, buried. In the spring of 1946, between 4000 and 5000 of these forcibly deported people are living as “displaced persons” in the Saarburg Barracks in Landsberg. The Landsberg D.P. Camp, as the American military government call it, at this time accommodated almost a quarter of the population of Landsberg. But D.P´s (displaced persons) are living not only in the camp, but also in the city itself, as well as in Dießen, Greifenberg, Holzhausen, Hübschenried and St. Ottilien. Conversely, many D.P´s cannot forgive “the Germans” for the suffering and injustice inflicted upon themselves and their families. 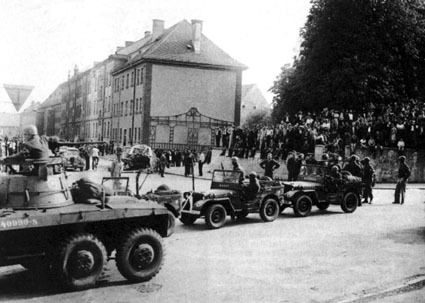 The situation between D.P´s and the population of Landsberg is tense and loaded. On the morning of the 28th April 1946, at 7am, Captain H.Mott, the Military Governor of Landsberg receives a message, causing him to make his way to Dießen without delay. In Dießen, 18 kilometers away from Landsberg there was at this time, located in the former Hotel “Finster”, a Kibbutz, called “Dror”, which operated a pottery training school for 50 D.P´s. During the night of 27th to 28th April, the leaders of the Kibbutz had doubled the sentry guards. Suspicious persons were hanging around outside the Kibbutz. The D.P´s felt threatened and the atmosphere was tense. 27 April 1946 was an important day. It marked the one-year anniversary since the survivors of the concentration camps of Landsberg and Kaufering had been liberated by US forces. On this evening, many dark memories are brought back to life. Two Hungarian Jews, Morchaj Rain and Oszer Blosztein are assigned sentry duty. As they make their rounds on Sunday 28th April, at 3.30am, both of them disappear without trace. In the “Dror” Kibbutz, a great commotion ensues. Despite an intensive search, both men cannot be found. The police are informed, as well as the Landsberg Military Governor. The leaders of the Kibbutz believe the men have been kidnapped. Captain Mott immediately initiates an investigation. The two sentries are still nowhere to be found. Further investigation reveals a clue. The stationmaster of Riederau Station reports having seen two men matching the description of the two sentries boarding a train at 5.30am. In the meantime, rumours of the kidnapping of the two sentries have reached the D.P camp in Landsberg. In no time, the most incredible tales are spreading: It is reported that Germans armed with machine guns have attacked the “Dror” Kibbutz, and kidnapped six Jewish children, whilst killing six others. Enraged and embittered, at 9am the people begin gathering on the street outside the main entrance to the D.P Camp. Some want to air their grievances by organising a spontaneous demonstration, but soon things turn violent. “On 28 April at 9.30am, an uprising broke out amongst the Jews in the Landsberg Barracks. The Jews, in groups of 150, 50 and 10 people, attacked numerous passers-by, robbing some of them, and hitting them with sticks, and stabbing them with knives.” So read the report of the same day by Landsberg Police to the Security Officer of the Military government. Twenty passers-by, who fell into the hands of the angry D.P´s had to be treated in hospital. 7 suffered injuries serious enough to be admitted to hospital. “…As we got to the height of the hill, by the turnoff to the barracks, we were met by a great number of Jews, it could have been between two and three hundred. Some of them called out terrible insults, and stormed upon us. They formed a circle and attacked us with fists and boots. I received a great cut to my head and abrasions to my arms and feet. My comrade, E*, I think, was stabbed in the vicinity of his left kidney and was so badly injured that he had to be taken to hospital”, reported a then 16 year old high school student in his statement. The incensed crowd attacked not only passers-by, but also passing vehicles. A truck was stopped, and was pelted with a “hail of stones”, breaking the windscreen of the cab. Part of its load, five large milk cans, were stolen. The occupants were able to flee, terrified, with only light injuries. The bus driver Adolf G.*, who was driving a BAWAG bus towards the city, did not escape so lightly: “In the next moment, as I brought my bus to a stop, all the windows of my bus were broken. The doors of the bus were then ripped open and I was dragged violently out of the bus.” Adolf G* was beaten. He sustained head injuries, bruises and contusions. He managed to escape. He informed his superiors and the military government. When his colleagues attempted to retrieve the bus, they found only a burnt out, fully wrecked shell. In the meantime, reports and rumours about the riots in front of the D.P camp have been spreading like wildfire and the people of Landsberg are scared. This day of all days, on “Umsturztag” (Day of Overthrow), as the population called the day of liberation by the Americans, the first regional elections are taking place in Bavaria and many people, who would otherwise have voted, stay at home instead. Meanwhile, the Landsberg Police have informed Captain Lawrence, the chief of the Landsberg Military Police and Captain Mott about the violent incidents. A request goes out to Major Thorston, Provost Marshal (head of the Military Police) of the 9th division in Augsburg, for reinforcements, and he immediately sets out for Landsberg. When he arrives at about 10am, he comes upon “an agitated crowd of at least 1000 people” outside the D.P camp. Frantically, a small group of military police are attempting to drive the people back inside the camp. Major Thorston then takes charge and together with the director of the UNRRA, Dr. Adolphe Glassgold, manages to calm the masses, and drive them back into the camp. However the peace is deceptive and short lived. Less than two hours later, about 150 angry D.P´s slip out of the unguarded rear of the camp and attack barracks at Lechstufe 15. Again, innocent people are threatened, beaten and attacked with knives. The D.P´s break windows, destroy furniture and damage property. Lucie H.*reported: “My husband tried to plead with them, and calm them down. The Jews berated him and said that last night six Jews were killed, and their deaths must be revenged.” The husband’s attempts at appeasement were fruitless. The couple were beaten, had bricks hurled at them and they were attacked with a knife before finding safety in the barracks. After this Thorston takes a harder approach. He informs the leaders of the DP camp and the UNRRA directors that from 14.00 the military police will mercilessly open fire on anyone who attempts to leave the DP camp. He declares a state of emergency and imposes a curfew on the entire city between 19.00 in the evening and 05.00 in the morning. Military patrols carry out increased inspections and search the population for weapons. The first arrests are made. In the vicinity of Lechstaustufe 15 a number of Jews, including one carrying a knife are arrested. DP´s wanting to go into the old town or home are stopped and arrested. A delegation on it´s way to the military police to request the release of their three arrested comrades is also arrested. A total of 20 Jews from the DP camp are taken into custody. The Jewish Uprising of Landsberg is over. If the attitude of the Landsberg population towards the Jews had been characterised by mistrust and rejection before, then the riots of 28th April caused the sympathy for the Jewish DP´s to sink to new lows. The outrage of many citizens over the violent DP´s attacking helpless citizens comes at an opportune time for some. Suddenly, from being the perpetrators, sharing responsibility for the suffering and death of so many Jews, rather one becomes the victim of these very Jews, who in such a brutal way have beaten and injured “German compatriots”. At last a way to prove that Jews are not any better than Germans. When the "Süddeutsche Zeitung" published an article on 29th April 1946 reporting the events under the headline “Clashes in Landsberg”, Überreiter contacted the editor, demanding a correction be published, stressing that “the events constituted attacks on the civilian population, rather than clashes”. When the Berlin daily newspaper “Der Morgen” reported on 30 April 1946 on “Brawls in Landsberg”, Überreiter wrote a forceful letter, dated 10 May, demanding the paper print a correction to the “fully distorted and biased, fabricated” article. Copies were made of all the records documenting this “attack on the population” which had been prepared by the Landsberg City police between the 28th April and the 7th May 1946, were distributed without consideration for the parties involved. In the meantime, many rumours had been spreading amongst the population of Landsberg. The “Landsberger Zeitung” had been banned and received no licence from the military government since the 27th April 1946. The people on the ground therefore were relying on second or third hand accounts. This opened the door to exaggerations and distortions. The variety of contradictory reports reflected mostly fear and uncertainty, but also hate and outright antisemitism. When on Sunday 5th May 1946, a few children living in Immelmannstrasse complained of tummy ache, fatigue and diarrhoea, the conclusion was quickly reached that a Jew from the displaced persons camp had given them poisoned sweets. What the real cause of these children´s malady was can no longer be proved with certainty. However the fact is that five of these worried mothers considered the case so serious that on 6th May 1946, they filed a complaint with the Landsberg Police. At the same time none of them felt the need to have their child examined by a doctor. Naturally, the city authorities did not hesitate to publish a report on the case in the official gazette. The case fitted well into the general mood of the time. According to the interrogation records of the State Police in Kaufbeuren of 29th April 1946, the lorry driver, Vitus R.*, was stopped with his lorry on 28th April 1946 in front of the DP camp at 9:45am where he was attacked. The angry mob broke the windscreen of his driver´s cab, before he was able to escape with wounds. When Vitus R.*, reported the incident to the State Police in Buchloe he confirmed that five milk cans and their contents were missing from his truck. Many of these stories have lasted until the present day and are still peddled, in various versions, in Landsberg. It is still widely related in Landsberg that: “a bus filled with First Holy Communion children was set alight by the residents of the Jewish DP Camp.” This version has stuck around stubbornly and was last published in the “Landsberger Tagblatt” on 28th April 1993. Over the course of time, the bus belonging to “Bayerischen Wasserkraft AG”, which was stopped at 9:30 on the 28th April 1946, and after the driver Adolf G.* had been beaten up, was set alight by persons unknown, has become: “a bus filled with Fist Holy Communion children”. Of course this story is very believable, as on the day concerned –so called “White Sunday”, the second Sunday after Easter – First Communicants really were on their way to Church. However there is not the slightest evidence, neither in the interrogation of the driver Adolf G.*, recorded by the Chief of the Landsberg City Police, nor in the reports in the "Süddeutschen Zeitung", the "Schwäbischen Landeszeitung", the "Berlin Daily", "Der Morgen", the Jewish "Landsberger Lager Cajtung", the official Landsberg "Amtsblatt", or in the reports of the "American Forces Network Munich-Stuttgart" that the bus was “filled with First Holy Communicants”. Even in the minutes of the meeting of the Landsberg Administration board, held on the 2 May 1946, in which the events of the 28 April 1946 were discussed in detail, there is absolutely no indication of anything, which could possibly lead to the conclusion that the bus was filled with First Holy Communion children. Also in later descriptions of the events, for instance in the letter of the Mayor of Landsberg to the State Commissioner for the welfare of Jews in Bavaria, dated 9th May 1946, in the letter to the Bavarian Ministry of the Interior, dated 29 January 1947, or in a brief used by representative Franz Michel entitled “Protection from attacks by foreigners in the year of their liberation 1946” which served as background information for his proposal to the State Parliament, we find no reference whatsoever that indicates that this story contains even a grain of truth. With the occupying forces too, the reporting of incidents was none too accurate. In the "Incoming Message" of the "Office of Military Government for Germany" of 29. 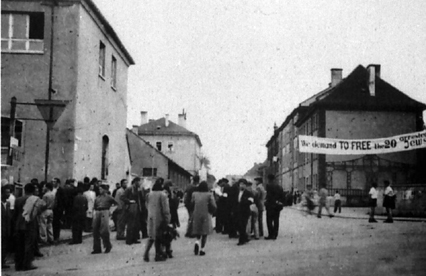 April 1946 it was reported that the unrest in Landsberg had resulted in two deaths. This erroneous report was immediately reported in the New York Times of 29th April 1946, along with further exaggerations that German voting booths had been “stormed by agitated D.P´s”. 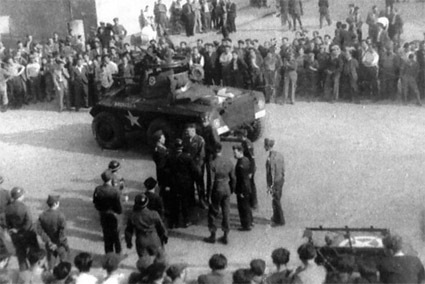 In the meantime the American military government had opened an “Incident Investigation” into the events of 28 April 1946. The “Schwäbische Landeszeitung” reported on 2 May 1946 that “the 20 Jews arrested during the Landsberg uprising” were to be charged on 3 May 1946 by the military court in Kaufbeuren with the offences “disturbance of public order and resisting and attacking organs of the allied troops”. Many D.P´s accused Mott, the military governor of Landsberg of anti-Semitism and believed that he had not taken strong enough action regarding “the occurrences in Dießen”. “4000 Jewish residents of the Landsberg camp for displaced persons have embarked on a hunger strike as a protest against the American occupying forces” reported the “jun. Press” of 30 April 1946. “Down with the Americans” cry the angry strikers (…) and protest loudly against the arrest of 20 Jews in connection with the clashes of last Sunday. “American anti-Semitism is worse than the anti-semitism of the Germans” some of the demonstrators shouted. Others declared: “American democracy is no better than the Nazi regime”…”all of us here in the camp refuse to work and refuse to eat until our 20 comrades are freed from Landsberg Prison, the place where Hitler wrote "Mein Kampf". The case against the 20 Jews began on the 3rd May 1946 before the ordinary military court in Kaufbeuren, without further incidents. When the Judge in charge, Captain Seymour D. Lubin, referred the case to the military tribunal in Augsburg because of the “seriousness of the offences” and the likely high level of penalties, the huge outcry was not only limited to the accused. This was because American law saw insurrection in a very serious light with hefty penalties, including the death penalty. On 22 May the verdict was announced. In his judgement, Lieutenant Colonel Batty said that during the entire course of the trial “no determinative proof was presented that the accused took part in the beatings, the stabbings and the destruction of property, however 19 of the accused are found guilty of participating in a riot and disturbing the peace”. He addressed the accused personally: “Without doubt, all of you and your families have endured indescribable suffering at the hands of the Germans, but this does not justify, so much later, the taking of retaliatory action. From now on the U.S Army is responsible for governing the American zone and cannot tolerate such violations against law and order, from yourselves, or anybody else”. Six of the accused were sentenced to two years, twelve accused were sentenced to one year and one of the accused was sentenced to three months in jail. One of the accused was found not guilty. 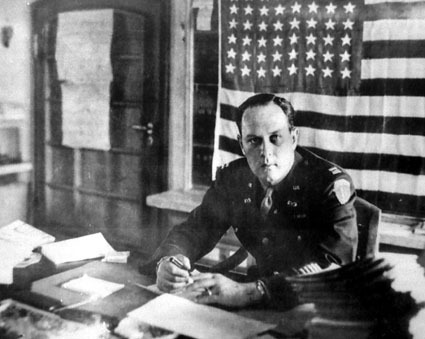 Lieutenant General Adcock, acting military governor of the American zone of occupation confirmed the judgements handed down at Augsburg. However eleven of the sentences were reduced and five of the accused had their sentences commuted after six months. In his decision, the acting military governor stressed that the accused: “were indeed guilty, but in determining their sentences their youth, and the terror to which they have been subjected by the Nazi regime must be taken into account”. * All names marked with an asterisk are known to the author, however because of data protection regulations they cannot be shared with the reader. © 2016 All rights reserved by Manfred Deiler including propagation by film, radio and TV, photomechanical reproduction, all kinds of sound carriers as well as of excerpts of reprint or savings and the reclaiming in data processing equipment.